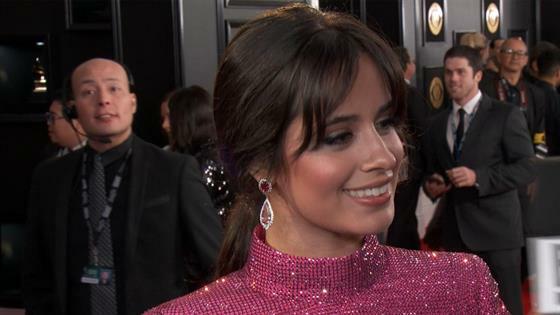 Camila Cabello will be surrounded by her loved ones at the 2019 Grammys, and not just on the red carpet. The first-time Grammy nominee is set to open the show on Sunday with a performance featuring Ricky Martin, J Balvin, Young Thug and Arturo Sandoval. She attended the ceremony with her parents, sister and grandmother. "You might see them on stage, actually," Cabello told E! News' Ryan Seacrest on the red carpet. "The performance is based off of my grandma's childhood," she said. "So basically, she grew up in...like a house full of rooms, and everybody shared a common patio, and there would just be few jam sessions and stuff, and the whole thing is based off of my family, and I have my family in the performance. So I feel very protected." Cabello, who left Fifth Harmony in late 2016 to start a solo career, has never received a Grammy nod prior to 2019. This year, she was nominated for Best Pop Vocal Album for her debut solo album Camila and Best Pop Solo Performance for its hit single "Havana." Ariana Grande won in the former category for her album Sweetener, marking her first Grammy win. This year, Cabello partnered with Mastercard to offer "Priceless experiences that reflect the exclusivity, collaboration and access the partnership will provide, allowing fans to experience Cabello's music like never before." A new commercial featuring the singer will air during the Grammys. "I did a show with Mastercard Wednesday," she told Seacrest. "And they basically gave two fans surprise tickets to the show. They had never seen me live before. We met them and had a good time, gave them some roses."